A RIB (Rigid Inflatable Boat), is a light-weight but high-performance boat constructed with a solid hull & a rubber flexible tube round the gunwale. This proven design allows for fast & stable travel with great seaworthy capabilities. The original concept was conceived by the Royal National Lifeboat Institution team working alongside Dag Pike in 1964. The hull was originally constructed of plywood & were rather uncomfortable at speed & had a tendency to break-up. Simultaneously, development was being undertaken by students at Atlantic College in South Wales, where the rigid section was formed as a deep vee hull to add strength. The Atlantic College RIB’s were found to be an effective rescue craft for the college’s fleet of sailing boats on the Bristol Channel; the college became an Inshore Lifeboat Station for the RNLI in 1963. It wasn’t until 1968 that the first fibreglass hull was designed. Initially it wasn’t that successful, but with progressive development, led to the design & build of a 21ft twin engined RIB that went on to race in the 1969 Round Britain Powerboat Race; it was one of the few boats to cross the finish line. The RNLI moved development to its research centre in Cowes, and utilising the Atlantic College’s Atlantic 21 class design, developed their own inshore lifeboats that entered service in 1972 and continued to be in service for for many more years. The choice of RIB’s on offer today is huge. Rigid Inflatable Boats, in their popular and established forms, can be heavily built offering relatively soft cruising hulls, wrapped in a large diameter inflatable tube providing assisted buoyancy, which in-turn contributes to the users comfort and confidence while absorbing any high speed knocks and bangs out in rough conditions. If you are looking for a lively experience in demanding seas and happy to overlook some of the refinements that sports boats tend to offer, take a closer look to what RIBS can offer you and your family. A good all-rounder and family friendly example would be GRAND RIBS. Not only are you getting a high quality craft, you will also appreciating the comfort and outstanding handling characteristics that these RIBS have to offer. An incredible range together with a comprehensive list of options and accessories means you can select and equip your RIB to meet you and your families precise personal requirements. Additionally, there is a wide range of colour schemes for the tubes, GRP hull and upholstery providing you with the facility to create something truly unique & personal to you. If you are seriously considering a RIB, we are in a position to offer you your first taster of being out on the water. 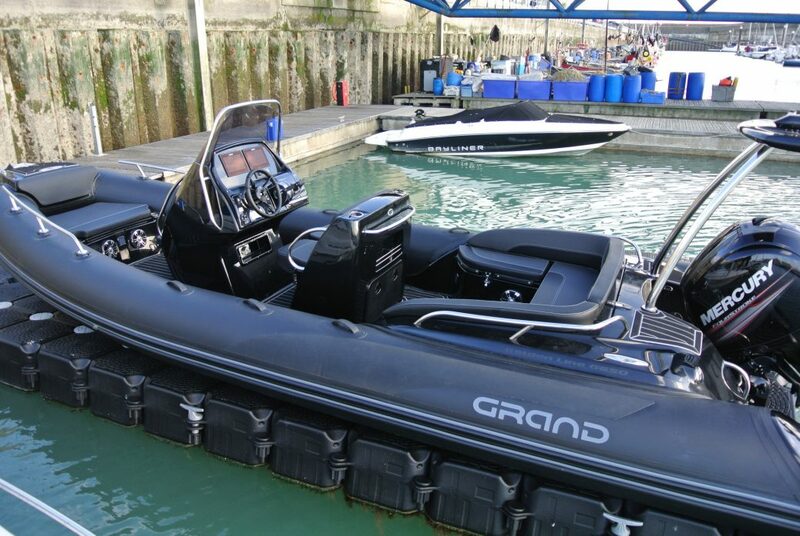 We currently stock a new GRAND Golden Line 650 which is rigged with a Mercury 150hp outboard engine that we keep on a floating dock in Brighton Marina. This is a fantastic opportunity of discovering the fun of blasting out across the open water. When you wish to take it further, the on-site RYA school will happily get you to grips with the basics of driving your new RIB which will help you to feel confident when taking your first trips and beyond.